Ed Sheeran congratulated a Scots schoolboy on his Easter poem about him before signing it in person. Harry Provan, 9 from Blairdardie met Ed outside his swish Scots hotel and showed him a school project he'd done over Easter. Harry had designed an Easter Egg called Egg Sheeran along with new lyrics for his song Thinking Out Loud. 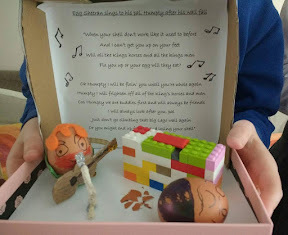 The humpty dumpty style poem included the lines 'When your shell don't work like it used to before, and I can't get you up on your feet'. An amused Ed told him he loved it and signed it for him to show his friends. Harry who was with his sister Jessica,12, said: "I gave him a photograph of my design which won the best egg competition in school. He seemed really chuffed with it and quite impressed." The singer also talked about his first experience trying Buckfast when he was just fifteen during his visit. Ed, who is known for enjoying whisky and has the Aberfeldy label tattooed on his arm, said: "My first actual night out properly my cousin took me to a dubstep club. I have a bunch of cousins who live here in Scotland. They had these black bottles of Buckfast and were drinking sludge. He added: "It really kicks you and you also know about it the next day." 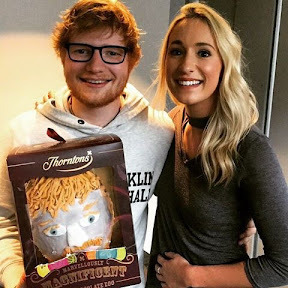 Ed also revealed he was spooked out by an Easter Egg given to him by Capital Breakfast DJ Amy Irons. The singer who played the SSE Hydro in Glasgow was given the Easter egg aka Easter Ed in the shape of his face after Amy's mum Fiona had spent the night icing it for him. On seeing it he said: "Bloody hell. Look at that. It has icing on it in the shape of my face. I'm convinced the hotel I'm staying in in Scotland is haunted and so do my manager and security guard so if I put it in their room this will freak them out at night." 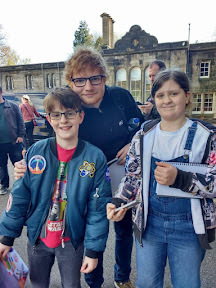 Ed added: "The most mad and obsessive I find are not the fans but the fan's mums cause they at all costs will sort it out for their daughter. They will grab you to get a picture and the daughter is always chilled and sorry about it. Dads as well are always polite so it's always the dad and fan who are sorry about her. It's one in four hundred mum's but there's always one and they literally grab you by the scruff of the neck." Ed also revealed he was worse for wear before playing the Scots gig. Coughing frantically he said: "I've had a chest infection for ten days now and thought it would go. My girlfriend came out to visit in Amsterdam and said in I won't come. I always get I'll for a few days but it not even man flu. It's beyond that."